The "home" of the United Nations Organization, located on the banks of the East River in New York, USA. It's not so much a dark site in itself, but it's the place where many of the whole world's dark current affairs are being monitored, debated and administered. So there are certainly plenty of dark associations about. The particular treat for the visiting dark tourist, however, are the guided tours, which also include exhibits of a decidedly grim nature. More background info: Just where to begin – and more so: where to stop? Countless books have been written about the UN and its work, but here only the very briefest of outlines can be provided. The United Nations Organization (UNO – but more commonly abbreviated simply as UN) was founded shortly after the end of WWII to replace the previous attempt at a world assembly, the League of Nations. Initially, it had 51 member states. Today the figure has gone up to 193 – virtually every nation on the planet. The UN's mission has primarily always been the prevention of war and relief of international crises – mainly by providing a platform for dialogue. In that sense, it's the highest diplomatic institution in the world. There are countless more specific sub-branches and associated agencies, including the WHO, the IAEA, UNICEF, and the World Food Programme. Some of these have their base and/or branches elsewhere (in particular in Geneva, Switzerland, and Vienna, Austria). 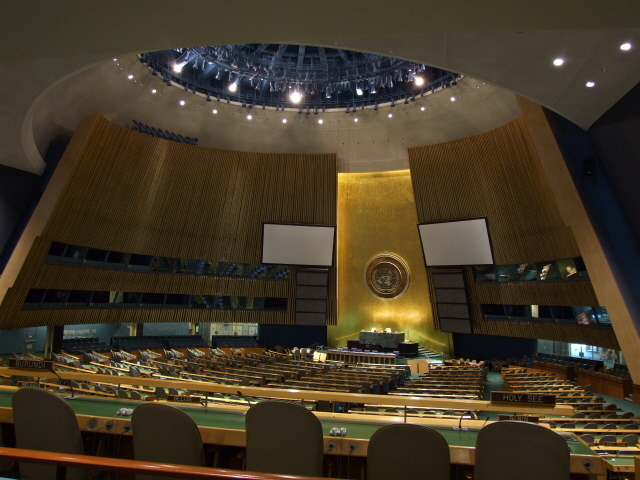 The heart of the UN, however, is the Security Council, with its five permanent members who enjoy veto-power, and an additional 10 non-permanent members rotating between other member states (a possible reform of this set-up has been an issue of some debate for many years). The five permanent members are the victorious powers of WWII (USA, Great Britain, France, Soviet Union/Russia) plus China – the countries which then also formed the first set of nations to wield an arsenal of nuclear weapons. All through the Cold War, the frequent "no" and "nyet" of the two opposing superpowers USA and USSR were a common ritual. Today, the UN is better known for its various peacekeeping missions and its blue-helmeted soldiers, many of them in Africa. 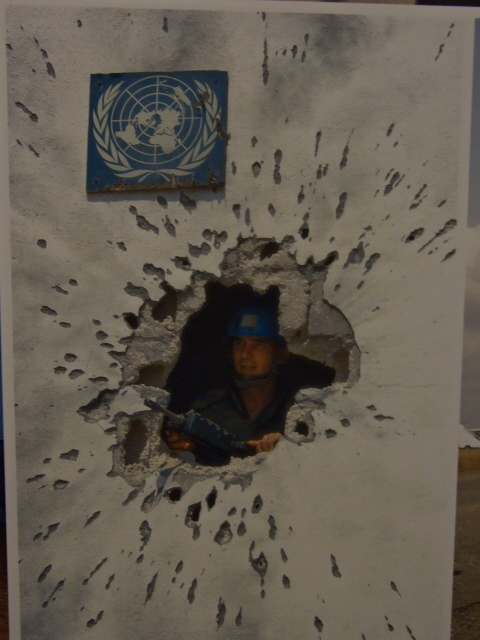 While these often provide essential help, there have also been some less than finest hours for the UN: for example, in its early years the authorization of the Korean War … which achieved exactly nothing, with the division between North Korea and South Korea remaining the most militarized border in the world to this day – see DMZ. More recently failure to prevent or at least intervene in the Rwandan genocide provided a black mark on the UN's record. 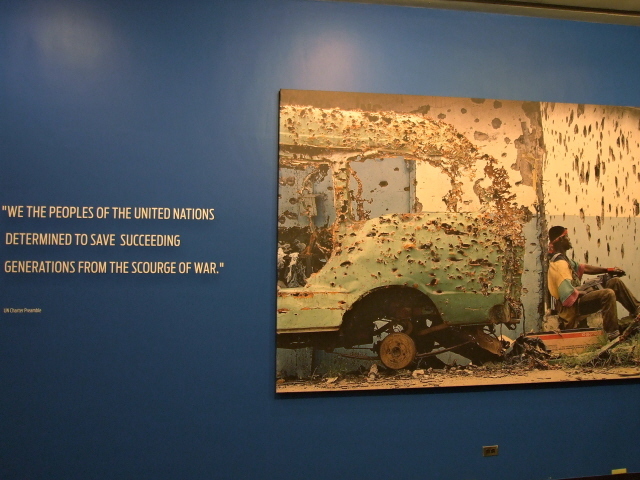 And the fact that even the UN troops present in Bosnia during the 1990s wars in the former Yugoslavia were unable to prevent the massacre of Srebrenica is also seen by many as one of the UN's worst failures (as is their general role in this conflict – well depicted in the movie "No Man's Land"). Probably the biggest blow for the UN, however, came in the run-up to the Iraq war in 2002/2003, when the USA simply went on to declare the UN "irrelevant" as it did not follow the Bush administration's push for war. The multimedia enhanced propaganda show put on by then Secretary of State Colin Powell in the UN to convince the media (rather than the unfazed UN) was a particularly grotesque lying event – which Powell later conceded was the lowest point in his entire career. In contrast, Joschka Fischer, Germany's then foreign minister (when Germany was temporarily chairing the UN Security Council), had one of his finest hours in office when he openly confronted US Defense Secretary Donald Rumsfeld, in English, bypassing the interpreters, spitting "you have to make the case [and] I am not convinced" – with Rumsfeld just staring back blankly in disbelief (as if to say "wasn't HE supposed to jump when I bark, not the other way round?"). Still the USA did go to war in Iraq in disregard of the UN and the rest, we would like to say, is history – only it isn't yet, insofar as that quagmire is still going on to the present day. 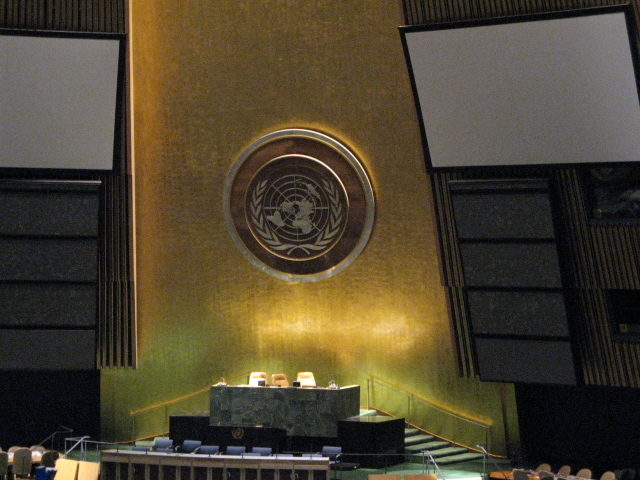 The UN took a while to get back on its feet but for now it seems to have more or less reasserted itself. What there is to see: As a tourist you can visit the foyer and gardens on your own, but more of the inside of the building is accessible only on guided or audio tours. First, however, you have to pass through extensive and extreme security screening in specially erected marquees outside the actual building – not surprising really, in such a place, but the process is a little annoying all the same. Getting through airport security is easier and quicker than this. In the grounds of the UN HQ there are a few interesting objects to look out for. One is a section of the Berlin Wall, another is the famous sculpture called "non-violence" which is basically an oversized gun (a revolver) made of bronze with a "knot" in its barrel … to name just two of the sculptures and other artwork on display here. Inside the public lobby you can see a line of portraits of every Secretary-General the UN has ever had – including the controversial Austrian Kurt Waldheim, whose questionable Wehrmacht past during WWII was revealed only after his term as SG, a revelation that made him a persona non grata in the USA! The desk where you have to sign up for tours is also located here in the foyer. Once you get a space on a tour, you'll be given wireless receiver headphones – so it's easy to follow the guide's narration even on busy days and in large groups. In addition to the guided tours in English there are also 45-minute audio tours available in Arabic, Chinese, English, French, Russian and Spanish. Audio tours come in two versions – one for adults and one for families with children. On the guided tours, an international member of staff from the UN takes groups around and provides commentary and explanations. On my tour it was a witty South-East Asian looking guy (I presumed Japanese) who made the tour not only informative but also entertaining. You usually get a viewing of the General Assembly Hall, which most visitors consider the highlight of the tour, and where considerable time is allowed for taking pictures (which, remarkably, is allowed everywhere on the tour). It is indeed quite something to see this iconic round assembly hall and its famous podium in the flesh from where so many famous – and infamous! – speeches were delivered to the world. According to the guide, some of the world's best-known "villains" used the opportunity to deliver lengthy speeches well in excess of the tacitly agreed 45-minute limit (Cuba's Fidel Castro and Libya's Colonel Gaddafi were apparently especially verbose). Also note the two rows of seats outside the members' area proper: that of Palestine and that of the "Holy See" (that's the Vatican) – what a juxtaposition! That's because neither are "proper" members. If you've seen the movie "The Interpreter" with Nicole Kidman, then this place will look additionally familiar – it was indeed shot on location here (in part). Spot the interpreter booth windows above the hall proper. A glimpse of the Security Council chamber, in contrast, is only occasionally possible – on the tour I was on in April 2010 it was not accessible (allegedly because of renovation work). 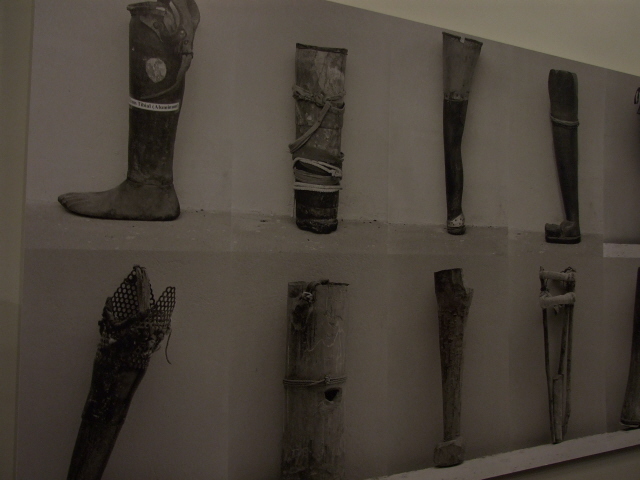 For the dark tourist, the real highlights are the exhibitions of artefacts, which includes some especially grim specimens: a collection of landmines for instance, together with photos of their mostly civilian victims, with prosthetic limbs, and the depressing statistics of this nasty topic (cf. 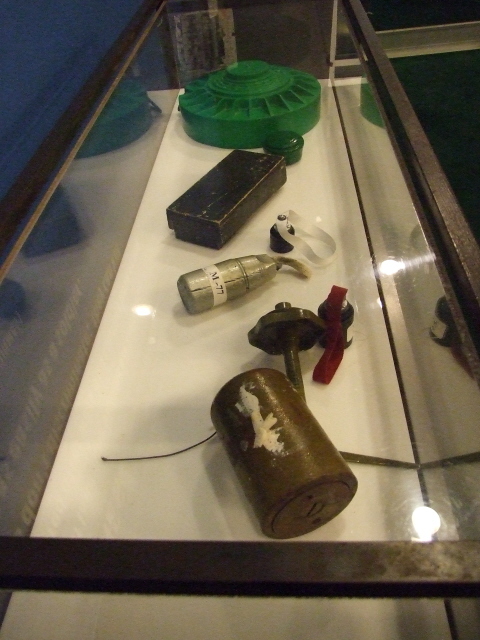 Cambodian Landmine Museum). 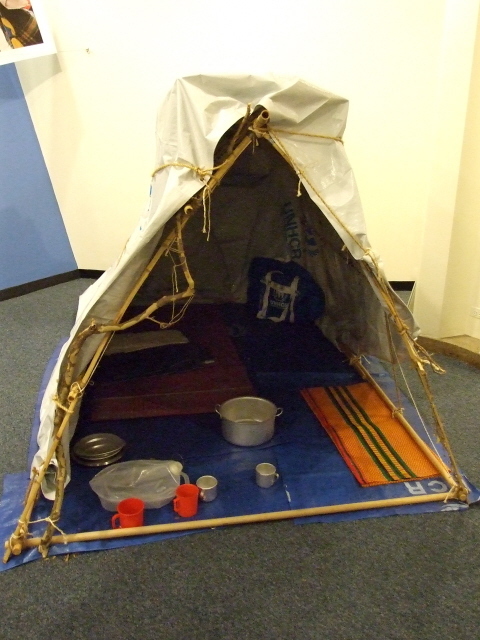 Also various remnants from Hiroshima and Nagasaki are on display, e.g. 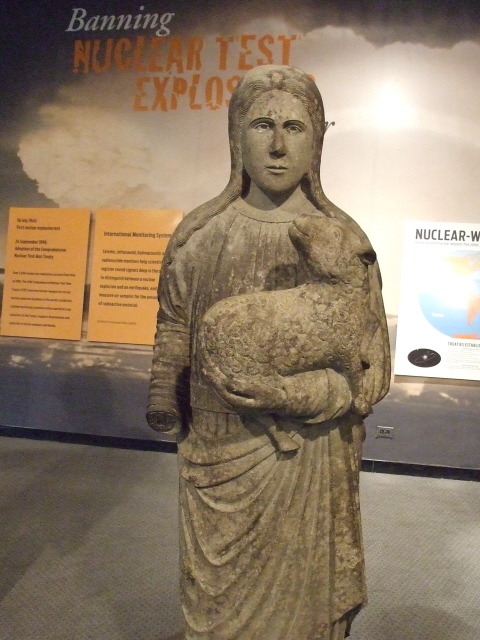 a statue of St Agnes (holding a lamb) from Urakami Cathedral which was found face down in the rubble after the nuclear nightmare. You can clearly see from which direction the blast and heat wave of the atomic bomb came. Various half-melted glass and ceramic objects are there to look at too, as well as a half-charred uniform of a schoolkid victim. Altogether nowhere near on the scale of horror as at the dedicated museums in those cities themselves, but still quite sinister and illustrative. And some of the accompanying photos are especially gruesome. Grim is also the section about the Holocaust, naturally, although here this is more restrained, quite brief and less graphic – the emphasis is more on the statistical incomprehensibility of this genocide. On the more uplifting side is an unusual exhibit: an AK-47 (Kalashnikov) machine gun that has been converted into an electric guitar!! Finally, one special series of information panels is dedicated to one of the clearly most unresolvable as well as longest-lasting conflicts in the world today: that in the Middle East between Israel and the Palestinians (and neighbouring countries). And with that you are left to return to the foyer. Here, in a glass display cabinet by the wall, you can have a look at the Nobel Peace Prize that was awarded to the UN, and in half to its then Secretary-General Kofi Annan, in 2001. The foyer also often houses special temporary exhibitions, so have a look what's on, it may also be of interest. Opposite, there's a separate and equally extensive souvenir shop. Here, blue is the theme colour for all manner of more or less tacky items, such as the usual coffee mugs, fridge magnets, etc., as well as a few useful ones. I was glad that umbrellas were available here when I visited in 2002 during a particular violent hailstorm that just wouldn't abate when I was ready to leave. Moreover, pieces of art and jewellery from various member countries are sold, some of them much classier and expensive. Also downstairs there's a small self-service cafe – which, however, cannot compete in quality with anything else here. Better get your caffeine or sugar fix elsewhere beforehand or afterwards. There's a special postal counter on site too. 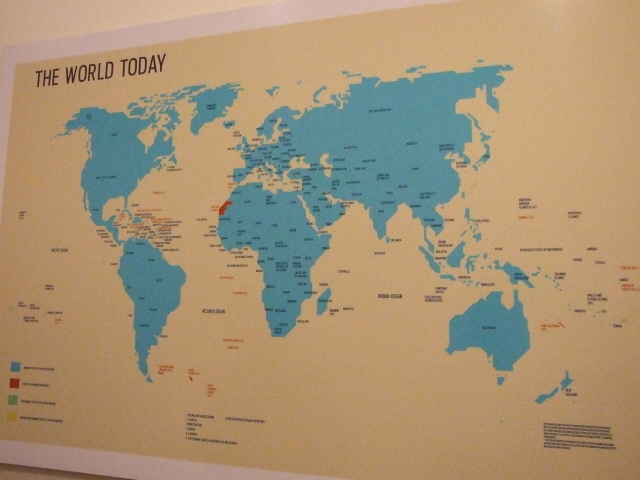 It sells UN stamps – as the UN HQ is its own postal "country" as it were – and letters and postcards with these stamps can only be mailed from here. Location: by the East River in Midtown New York City, USA, between the eastern ends of 42nd Street and 48th Street. The visitor entrance to the UN is on First Avenue/United Nations Plaza at 46th Street. Access and costs: at times restricted, and with tight security, weekdays only for guided tours, audio tours also available on weekends except in January and February; access is free, but tours are not particularly cheap. Details: To get to the UN you can first take the subway to Grand Central Station, served by subway lines 4, 5, 6 and 7, and then walk east along 42nd Street, or take the bus: lines M42, or M104 go down 42nd Street too. Restrictions will apply during the times the General Assembly is in session, usually from mid-September for a couple of weeks. Best to do it at another time – and check ahead. 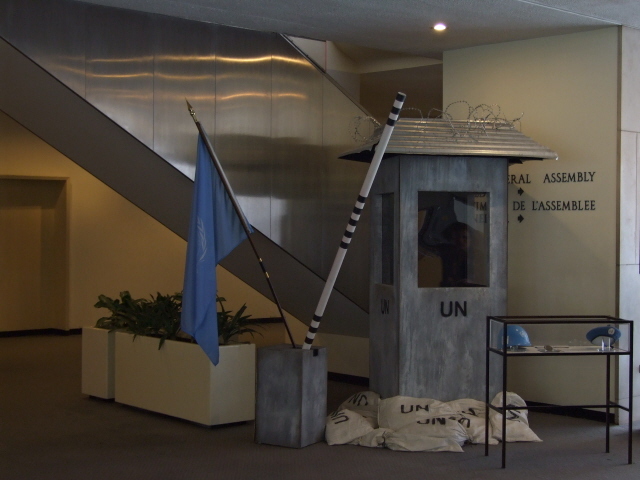 It is also possible that the UN HQ is closed to the public altogether, e.g. if there are high-level visits or crisis meetings. Also, the UN observes a range of holidays, including Muslim ones. Price: Admission to the grounds and the foyer as well as the concourse with the shops is free. Guided or audio tours cost 16 USD (11 USD for senior citizens and students). Times: Guided tours are available Mondays to Fridays from 9:00 a.m. to 4:45 p.m. – they may fill up fast, so be prepared for delays; you could check ahead by calling: 212-963-TOUR (8687) or book online via visit.un.org. Audio tours are also available at weekends from 10 a.m. to 4:15 p.m. except during January and February. Time required: Tours last about 45 minutes – but factor in plenty of time for the security screening at the general entrance, as well as for registration at the tours desk and possibly waiting time for the next available space on a tour. Extra time could also be allocated to a visit to the shops either before or after the tour. All in all, allow a minimum of an hour and a half for a visit to the UN, preferably more, especially if it's at a busy time and waiting time has to be factored in. Combinations with other dark destinations: see under New York. Combinations with non-dark destinations: The UN HQ location is perfect for combining a visit with a stroll around Midtown – and especially some of New York's finest skyscrapers, first and foremost the Chrysler Building on 42nd Street and Lexington Avenue. One block further west is the glorious Grand Central Station. A few blocks further west still is the pivotal point of Midtown Manhattan: Times Square. For sights further afield see under New York in general.